PHOTOS: Chinese Buddhist Monk Is Mummified And Covered In Gold : The Two-Way Fu Hou died in 2012 and his body spent more than three years in a pottery jar before it was sterilized, painted and gilded. The process honors his dedication to the religion. A man photographs the mummified body of revered Buddhist monk Fu Hou in March in Quanzhou city in southeastern China's Fujian province. 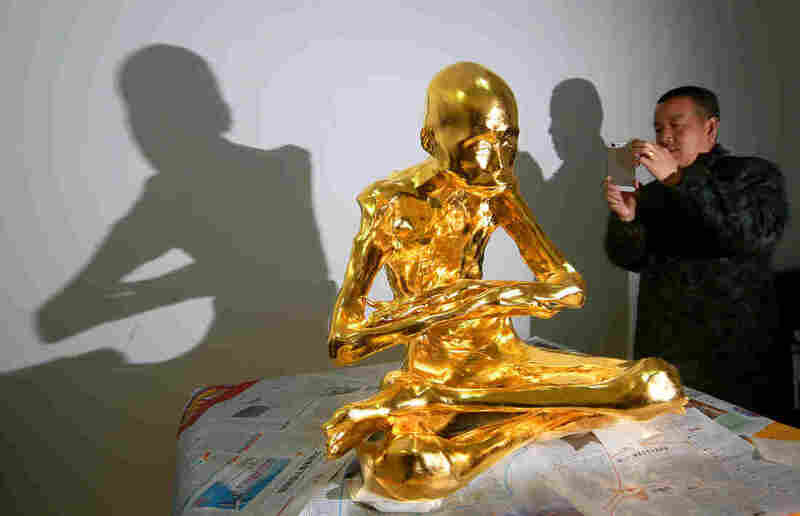 In the southeastern Chinese city of Quanzhou, a well-known Buddhist monk named Fu Hou has been mummified and encased in gold leaf. According to The Associated Press, it's "a practice reserved for holy men in some areas with strong Buddhist traditions" and was done to honor Fu Hou's dedication to the religion. Li Ren, the Chongfu Temple's abbot, said that after the 94-year-old's death in 2012, "the monk's body was washed, treated by two mummification experts, and sealed inside a large pottery jar in a sitting position," according to the wire service. Video published by The Daily Telegraph showed the "Open Cylinder" ceremony when the monk was removed from the pottery jar in January. The newspaper reported that thousands gathered for the event, and the video showed men cutting off the material wrapped around the monk's body. The abbot told AP that the body showed "little sign of deterioration apart from the skin having dried out." The wire service reported that "the local Buddhist belief is that only a truly virtuous monk's body would remain intact after being mummified." Men apply lacquer on the mummified body of revered monk Fu Hou in January. The monk's body was then sterilized and painted. The final step — gilding with gold leaf — started on March 16, according to The People's Daily. Li Ren said the golden statue "is now being placed on the mountain for people to worship," the wire service reported. The People's Daily has more pictures of the mummification and gilding process.